We had another amazing day of giving a voice to the voiceless South Korean dogs and cats. 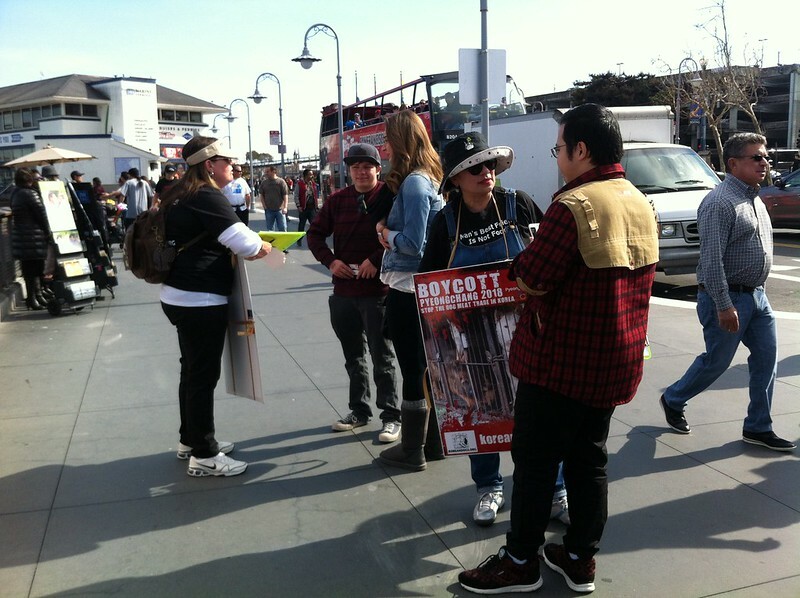 A big thank you to Elizabeth, Kit, Don, Tracey, Daniela, Orso the Golden Retriever, Karen and Giny for their dedication in helping to end the horrific South Korean dog meat trade, and for spending their Saturday advocating for these South Korean dogs! We are so grateful for their caring hearts and compassion. This was a Super Bowl 50 weekend, so there were tons of extra out-of-town visitors who came for that; and the weather was on our side, too, with the nice spring-like weather. We handed out leaflets in both English and Spanish, together with lots of freebies, such as bumper stickers which read “MAN’S BEST FRIENDS ARE NOT FOOD! KOREANDOGS.ORG”; also pens and key chains kindly donated by Bob Heisler. Thank you, Bob! We were there from 9am until 4pm, and managed to hand out over 1,200 leaflets. Literally tens of thousands of people walked by our displays, and were shocked and horrified by what they saw. They signed our petition, which was addressed to the South Korean President Geun-Hye Park, and we were able to collect 1,030 petition signatures. YAY! A new record! We also had a Korean tour bus dropping off lots of Korean tourists at this location, so they all saw us and our displays. We had a chance to talk to the tour guide and driver of that tour company, and they expressed their concern about how damaging our protest is to Korea’s image. 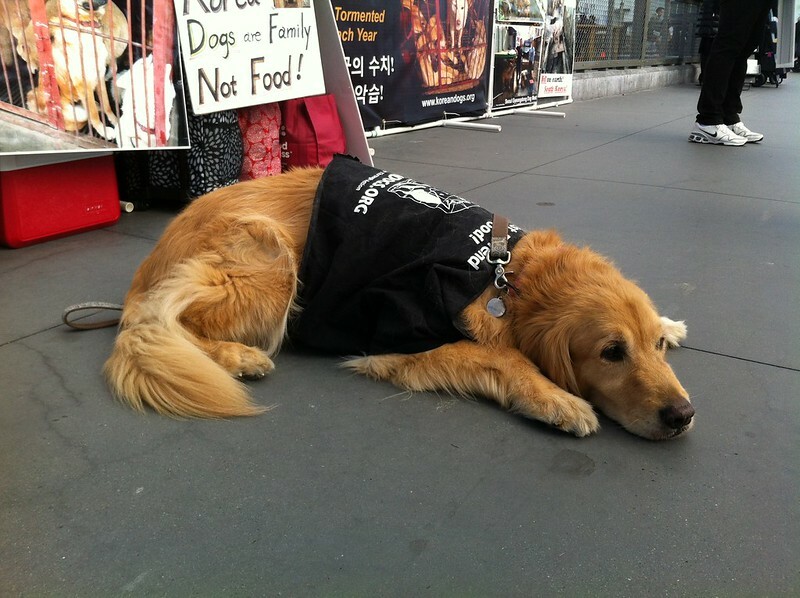 We told them that we have no choice but to protest because Korea is doing nothing to stop this horrendous cruelty. 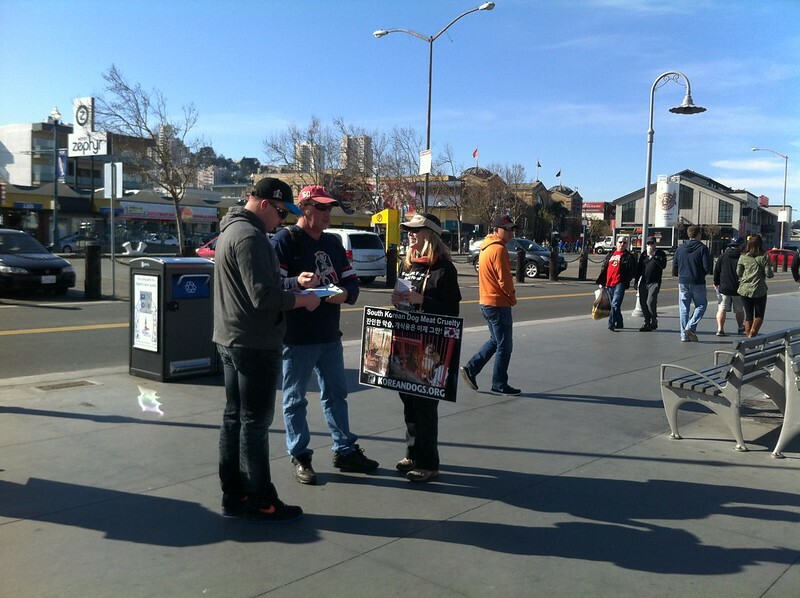 And, although the tour guide commented that he did not think that dog meat consumption will end over there, he did ask us for some leaflets which he was going to hand out to his customers; and we gladly gave him about 100 of them. 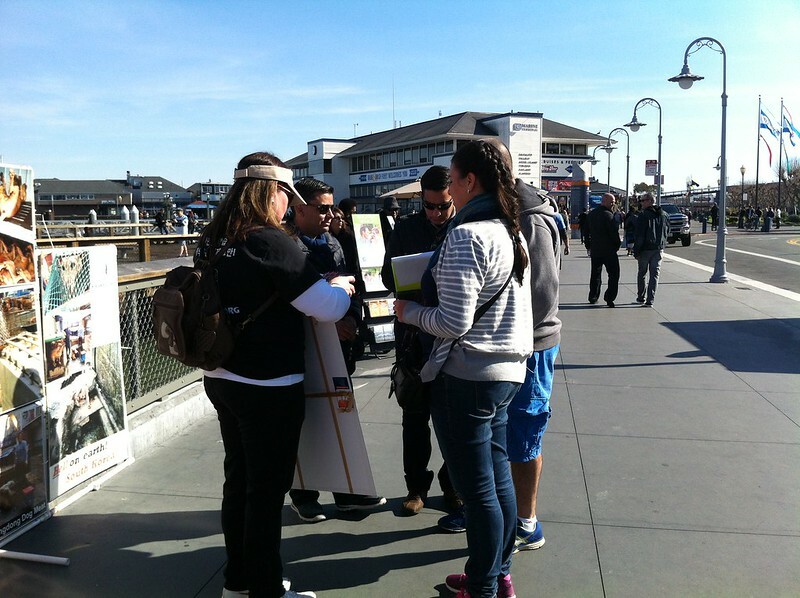 Many young Koreans walked by laughing and giggling at our presence but some of them were surprised and concerned by what they saw, and signed our petition when asked. 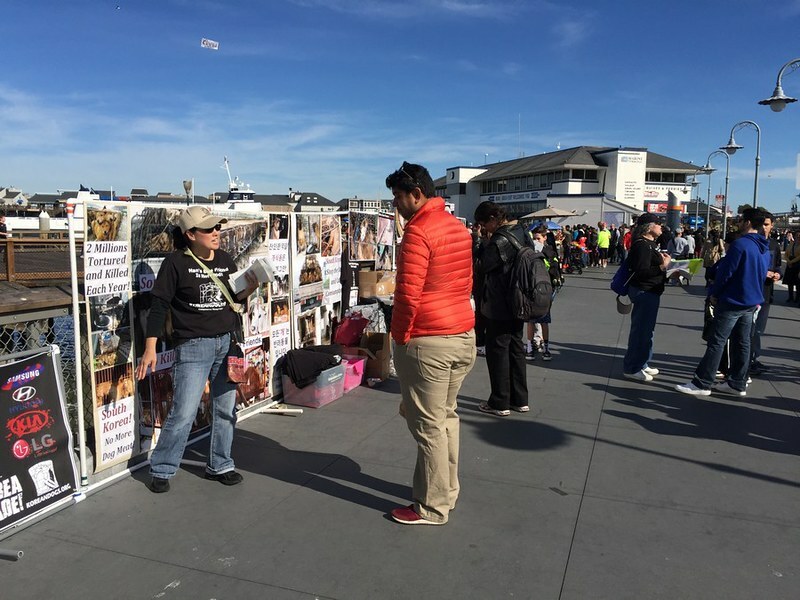 People continued to line up, even as we were taking down our displays, because they were keen to sign our petition and help these poor dogs; so our volunteers carried on collecting signatures while we were packing up, as they didn’t want to miss any of them. 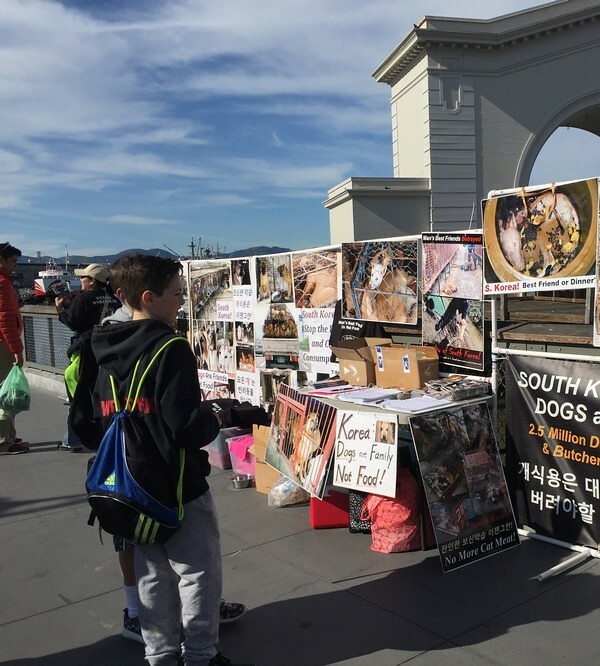 We also received several small donations, totaling $50, which we donated to Nami Kim and her team of dedicated activists and rescuers in Seoul, South Korea, who are continually fighting hard to end the dog meat trade and rescue as many dogs as they can from the dog meat industry. 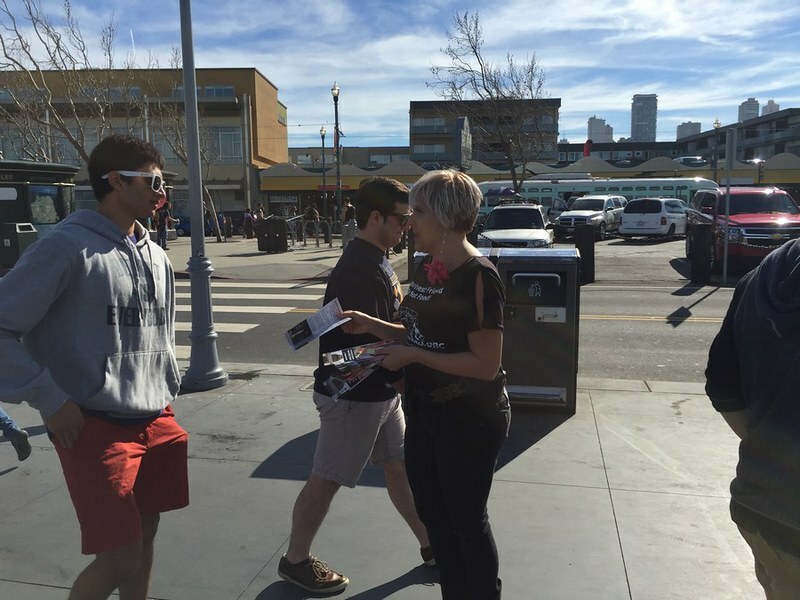 Update February 16, 2016: Petition signatures have been sent. 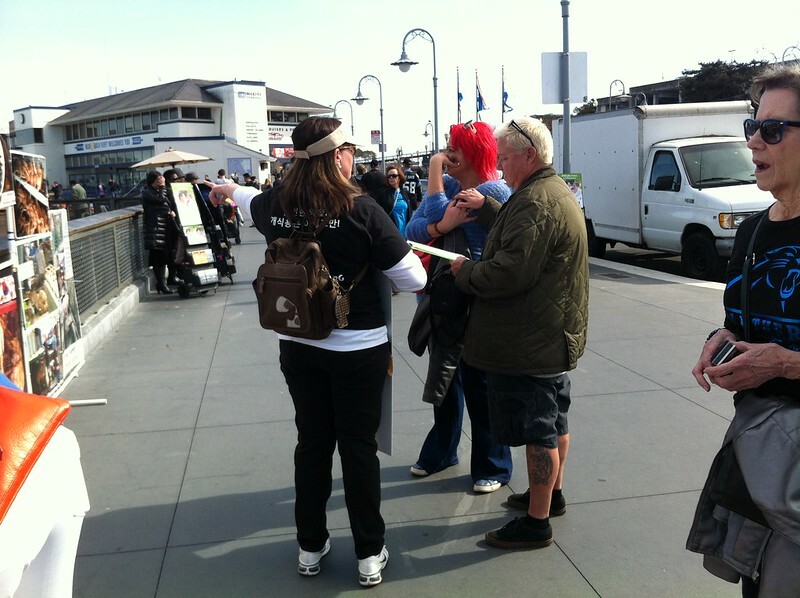 Copies of all 302 pages of the petition signatures which we had collected since we began collecting signatures at the San Francisco Fisherman’s Wharf events on February 16, 2014, were sent to the petition targets noted below, on February 16, 2016 via the U.S. 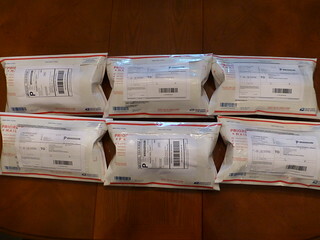 Postal Service Priority Mail. 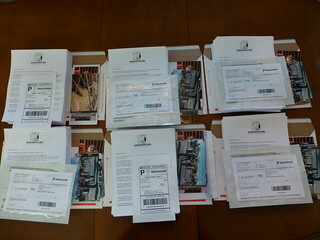 Petition parcels were sent to the UN Secretary General Ki-Moon Ban and the Ambassador Ho-Young Ahn via U.S. Postal Service Priority Mail with Signature Confirmation Restricted Delivery which provides an added level of assurance by requiring the signature of the addressee or their authorized agent, upon receipt.